198 Beacon is located on the north side of Beacon, between Clarendon and Dartmouth, with 196 Beacon to the east and 200 Beacon to the west. 198 Beacon was built in 1862-1863 by contractor and builder John W. Rollins, one of six contiguous houses (198-200-202-204-206-208 Beacon), each built in the same design with all six unified by a single cornice and roof line. John Rollins and his wife, Elmira (Nutter) Rollins, lived at 85 Pleasant. 200-208 Beacon were sold between November of 1863 and February of 1864. 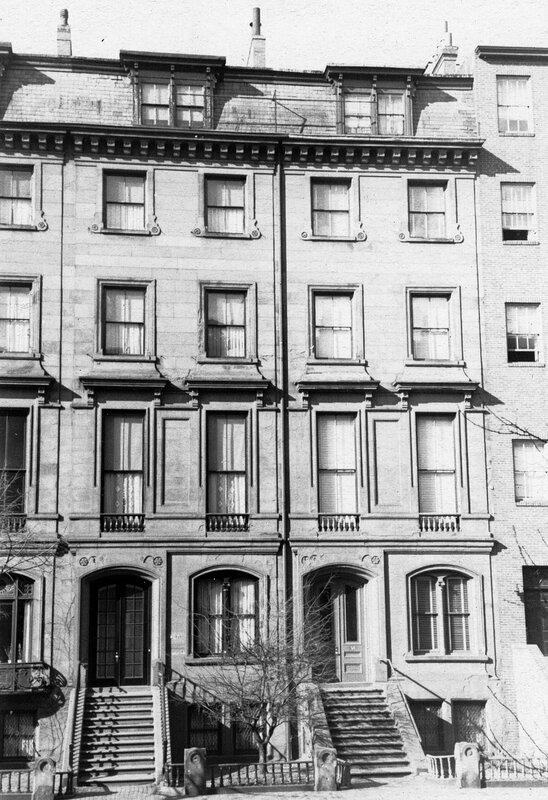 On February 22, 1864, after the fifth house (202 Beacon) had been sold, John Rollins acquired all of John Borrowscale’s and Samuel Hazard’s remaining interests, leaving him with the entire equity ownership of the sixth and last house, 198 Beacon. Click here for an index to the deeds for 198 Beacon. By 1864, 198 Beacon had been leased from John Rollins by banker Richard Tucker Parker and his wife, Martha Sylvester (Thorndike) Parker, whose daughter, Mary Martha Parker, was born there in March of 1864. They previously had lived at 91 Beacon. On March 23, 1865, John Rollins transferred 198 Beacon to his wife, Elmira. On February 10, 1866, 198 Beacon was purchased from Elmira Rollins by Henry Flanders, owner and editor of the Boston Traveller newspaper, and his wife, Delia Pierce (Kingsley) Flanders. They lived at the Hotel Pelham (southwest corner of Boylston and Tremont) and then in West Roxbury. 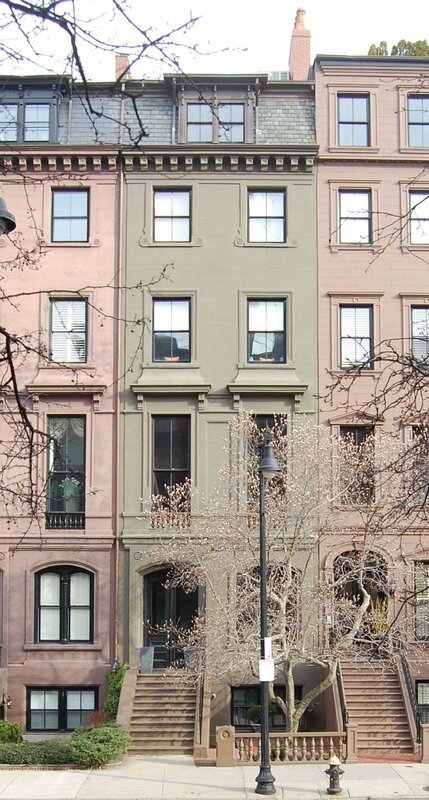 The Parkers continued to live at 198 Beacon, leasing it from Henry Flanders, until the fall of 1868, when they traveled abroad. By 1869, 198 Beacon was the home of shipping merchant Alexander Hamilton Twombly and his wife, Caroline Matilda (Williams) Twombly. He died in May of 1870 and Caroline Twombly moved soon thereafter to a new home she had built at 304 Beacon. By 1871, 198 Beacon was the home of textile manufacturer Charles Amory and his wife, Martha Babcock (Greene) Amory. They previously had lived at 9 Marlborough. They also maintained a home in Nahant. By 1873, they had moved to 225 Beacon to live with their son, Copley Amory, whose wife had died in April of 1871. By 1873, Henry and Delia Flanders had made 198 Beacon their home. They continued to live there until about 1875; by 1877 they were living in the Forest Hills section of Jamaica Plain. On November 18, 1874, 198 Beacon was purchased from Henry Flanders by Mary Ella (Bearce) Paterson, wife of real estate dealer Thomas S. Paterson. They lived at 24 East Canton. On April 30, 1875, she sold it to Albert S. Gove of Middleborough, and on the same day he sold it to Apphia Augusta (Badger) Ball, the wife of real estate broker Eben Wallis Ball. On December 9, 1875, the Boston Five Cents Savings Bank foreclosed on its mortgage to Henry Flanders (which had been assumed by the subsequent owners) and sold 198 Beacon at public auction to Francis Henry Morgan, a mortgage and note broker, who sold it the same day to Henry L. Wetherell. On December 28, 1875, the filed a permit application to construct a stable for two horses and carriage house at the rear of 198 Beacon. He subsequently abandoned the permit. Henry Wetherell was a paper box manufacturer from Ware. He was married to Lorinda (Laurinda) Eliza (Winslow) Wetherell. Her brother was Ezra Dyer Winslow. On January 18, 1876, Henry Wetherell sold 198 Beacon to Susan C. Ayers of Newton, as trustee for the benefit of Arthur Francis Winslow, the son of Ezra Dyer Winslow and his wife, Sarah Jane (Ayers) Winslow, Susan Ayers’s sister. Ezra Dyer Winslow was soon to become known as one of Boston’s prominent swindlers. His creditors established that he had used the transactions by his brother-in-law and sister-in-law to hide his assets, and brought legal action to obtain 198 Beacon. Ezra D. Winslow had settled in Boston following the Civil War, in which he had served as a chaplain. He established himself as a Methodist minister and agent for the Zion Herald and soon began an active real estate and mortgage dealer. He and his wife settled in the Auburndale area of Newton, where he developed the Islington area in the early 1870s. He served as a member of the Massachusetts House of Representatives in 1872-1873, and of the State Senate in 1875. By 1874, he also was publisher of the Boston Daily News and the Post newspapers. In March of 1877, the Supreme Judicial Court ordered that Susan Ayers transfer 198 Beacon to Ezra D. Winslow’s assignees in bankruptcy. There remained a mortgage on the property which Henry Wetherell had entered into with the Boston Five Cents Savings Bank and it had assigned to Andrew Wellington. That same month, Andrew Wellington foreclosed and took possession of the property. On April 6, 1877, 198 Beacon was acquired from Andrew Wellington by Ruth Wetherbee (Brooks) Prescott, the widow of Otis Brigham Prescott, and on April 9, 1877, Ezra D. Winslow’s assignees in bankruptcy released their interest in the property to her. She previously had lived at 9 Beacon. In September of 1877, she filed for (and subsequently received) permission to build a laundry house at the rear of the property. Mrs. Prescott was living elsewhere during the 1879-1880 winter season, and 198 Beacon was the home of dry goods merchant Nathaniel Willard Pierce and his wife, Catherine Hatch (Collamore) Pierce. They previously had lived at 41 Chestnut. The Pierces had moved by mid-1880 and 198 Beacon was once again Mrs. Prescott’s home. 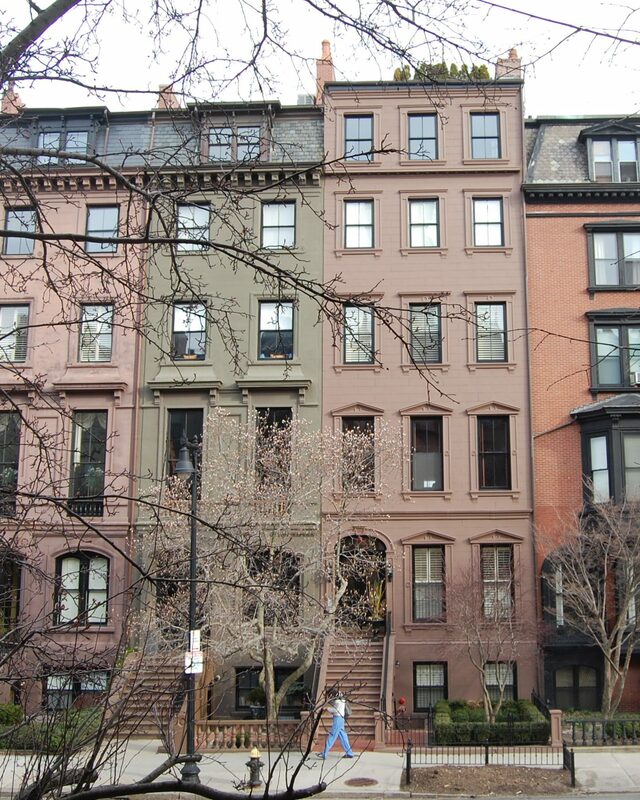 By 1882, the Pierces were living at 339 Beacon. By 1880, Ruth Prescott had been joined at 198 Beacon by her brother, Nathaniel P. Brooks, a coal dealer. Also living with her in 1880 were her two unmarried daughters, Sarah Ann Prescott and Harriet Ellen Prescott, and her daughter, Katherine (Kate) Smith (Prescott) Ward, the widow of Charles Chandler Ward, and the Wards’ son, Prescott (Charles) Temple Ward. Katherine Ward and her son had lived at 9 Marlborough in 1878 (she had separated from her husband, who died in January of 1879). 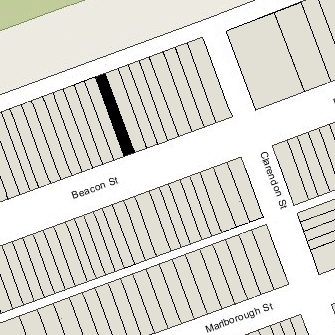 Katherine Ward and Prescott Ward continued to live at 198 Beacon in 1882, but moved thereafter. In 1886, 198 Beacon also was the home of Charles Greenleaf Wood, treasurer of the John Hancock Insurance Company. He was a widower and had lived with his son and daughter-in-law, Charles and Mary (Knight) Wood, at 274 Marlborough until about 1884. He moved from 198 Beacon soon thereafter. Ruth Prescott died in November of 1887. After her death, her daughters, Sarah and Harriet, continued to live at 198 Beacon along with their uncle, Nathaniel Brooks. He died in August of 1890. The Misses Prescott accepted lodgers on occasion, and during the 1891-1892 winter season, they were joined by Almon Augustus Strout and his wife, Mary Robertson (Sumner) Strout. He was a lawyer from Portland, Maine, who had recently opened an office in Boston in partnership with William H. Coolidge. By 1893, they had moved to the Hotel Vendôme. Sarah Prescott died in December of 1894. Harriet Prescott continued to live at 198 Beacon until her death in December of 1923. 0n February 29, 1924, 198 Beacon was acquired from Ruth Prescott’s estate by Dr. Algernon Coolidge, Jr., and his wife, Amy Peabody (Lothrop) Coolidge. They had lived at 487 Commonwealth in 1923. They also maintained a home in Cotuit. In February of 1924, Dr. Coolidge filed for (and subsequently received) permission to remodel the laundry house at the rear of the property into a garage. They continued to live at 198 Beacon until his death in August of 1939. Amy Coolidge moved soon thereafter to 101 Chestnut. On October 1, 1940, 198 Beacon was purchased from Amy Coolidge by Donald Carter Starr and his wife, Ethel (Polly) Randolph (Thayer) Starr. They previously had lived at 5 Otis Place. Donald Starr was an attorney, author, and avid sailor. In the 1950s, he led efforts to create parks and lagoons at the banks of the Charles River in conjunction with construction of Storrow Drive. Polly (Thayer) Starr was a noted artist. In June of 1967, the Starrs applied for (and subsequently received) permission to install a new picture window on the fifth floor in the rear of the house. Donald Starr died in March of 1992, and on December 11, 1997, Polly Starr donated the house to Harvard College. On March 3, 1998, Paul J. Donahue, Sr., purchased 198 Beacon from Harvard College. The property subsequently changed hands. It remained a single family dwelling in 2015.